Gov. Greg Abbott has extended the State Disaster Declaration for Texas counties affected by Hurricane Harvey. All Texas counties declared disaster areas will continue to be eligible for assistance as they recover and rebuild after Hurricane Harvey. There are currently 60 counties included in the state disaster declaration. State Disaster Declarations must be renewed every 30 days for assistance to remain available. Gov. Abbott will continue to renew them as they are needed throughout the recovery process. Counties currently declared disaster areas include: Angelina, Aransas, Atascosa, Austin, Bastrop, Bee, Bexar, Brazoria, Brazos, Burleson, Caidwell, Calhoun, Cameron, Chambers, Colorado, Comal, DeWitt, Fayette, Fort Bend, Galveston, Goliad, Gonzales, Grimes, Guadalupe, Hardin, Harris, Jackson, Jasper, Jefferson, Jim Wells, Karnes, Kerr, Kleberg, Lavaca, Lee, Leon, Liberty, Live Oak, Madison, Matagorda, Milam, Montgomery, Newton, Nueces, Orange, Polk, Refugio, Sabine, San Patricio, San Augustine, San Jacinto, Trinity, Tyler, Victoria, Walker, Wailer, Washington, Wharton, Willacy and Wilson. • Gov. Abbott and HUD Deputy Secretary Pamela Hughes Patenaude announced a $5.024 billion grant provided through HUD's Community Development Block Grant Disaster Recovery Program to support the repair of damaged homes, businesses and critical infrastructure in the state. The grant will be administered by the Texas General Land Office. • More than $490.3 million in Public Assistance funding from FEMA for state and local governments has been obligated, and 938 Requests for Public Assistance have been received from jurisdictions, as of Nov. 15. • The Commission held regional meetings in Beaumont, Sugar Land and Victoria along with representatives from FEMA, the Texas Division of Emergency Management and the Texas General Land Office. Mayors, county judges and other local officials engaged with subject matter experts on public finance issues, debris management, housing, structural standards, workforce issues, and flood control, mitigation and land development. Meetings in two more regions are scheduled this month. • TDEM estimates nearly 10 million cu. yds. of debris have been collected, about 37 percent of the anticipated total. • Workforce Solutions Offices statewide have enrolled 300 disaster-affected participants and placed 85 participants in temporary jobs as well as provided career services and training to nearly 300 individuals. • Texas Workforce Commission has allocated nearly $3 million in training grants to 12 community colleges in Harvey-impacted areas. Training began the last week of November for local demand occupations related to rebuilding, such as electrical technicians, OSHA Hazardous Materials certification, HVAC, mold remediation, carpentry, roofing and plumbing. • TWC has more than 12,000 disaster-related job openings available on HurricaneHarvey.jobs and WorkInTexas.com. • TWC has identified more than 22,500 Hurricane Harvey impacted jobs seekers in WorkInTexas.com. 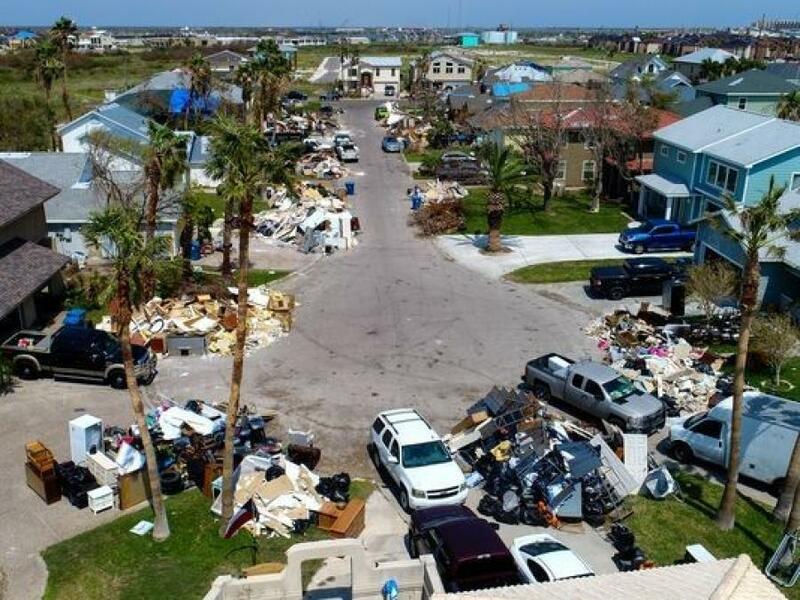 • More than 660 manufactured housing units are being installed or have been turned over to displaced families through one of several FEMA-funded direct disaster housing programs being locally led and state managed by the Texas General Land Office. • 2,735 applicants are in the final stages of the direct disaster housing process. • The Texas General Land Office recovery team presented a new flag to a U.S. Navy veteran and his family to replace one destroyed during Hurricane Harvey. • TexasRebuilds.com is the housing information source for individuals and communities. • The deadline for all school districts and charter schools affected by Hurricane Harvey to apply for Federal Communications Commission E-rate funds to replace damaged equipment and services is Dec. 13, 2017. • 24,618 Harvey survivors have called the Cleanup Assistance Hotline at 844-965-1386. Volunteer groups have completed 18,139 requests to muck and gut flood-damaged homes. • 51,268 volunteers have donated more than 3.2 million volunteer service hours which are carefully tracked and can be applied to a community's cost-share offset if eligibility requirements are met as determined by FEMA's Public Assistance program. • Rebuild Texas Fund totals $86.7 million: RebuildTx.org.